Looking to use your outdoor space and the bugs are getting to you, try the Better Homes and Gardens 11 foot offset Patio Umbrella with Mosquito Screen. 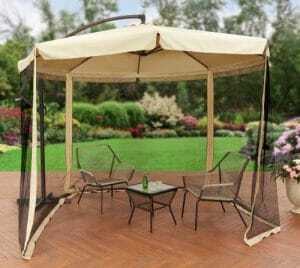 You can put a bistro set or a small conversation set under this umbrella with netting and keep the flying pest away. This would be a great way to keep the sun out during the day and the mosquitoes at bay during the nigh time hours. Add some lights and you will extend the time you can enjoy your outdoor entertaining area. Now lets look at the details of this offset patio umbrella and see if it fits your needs. For some of my other shade solutions with offset umbrellas, see my post here. You will get a large patio offset umbrella that has a netting hanging from the ends of each of the eight ribs. The netting will attach to the ribs with a Velcro material. Zippers will connect each panel of netting that can go all the way around the umbrella canopy. The edges of the netting has a heavier material for added strength. The metal parts are made of steel with a powder coated finish. 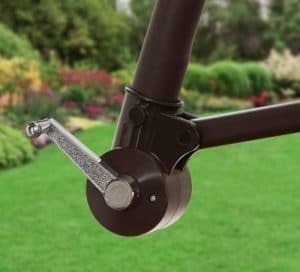 A handle will let you set the height of the umbrella and a crank will raise and lower the umbrella canopy when needed. The Beige Canopy will be made from a fade resistant polyester fabric. The canopy will be 128.5 inches across when opened and will extend to 98.2 inches tall when fully opened. Canopy will cover about 90 square feet of space when opened and netting installed. The ends of the canopy will have a scalloped edge to hide the top of the netting. 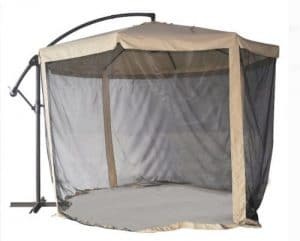 I have a friend that has an offset patio umbrella by the pool, this one with the netting to keep the mosquitoes away after dark would be a great addition for her. This offset patio umbrella can be used without the netting during the day light hours and the netting attached when you are having a late night party. You will also have to purchase four large paver stones to place on the umbrella base for counter weight on this offset umbrella. 16 inch by 24 inch and 2 inches thick are the recommended size to keep this umbrella stable during light to moderate winds. No patio umbrella should be up during high winds. After the base is assembled and weights are added the pole just slides into the base and you are ready to use your umbrella. The netting will attache to the end of each rib with Velcro. This will be easier if the umbrella is all the way up. A zipper will connect each panel of netting together. You can choose where you want your opening to get in and out of your enclosure. Care of your offset patio umbrella will be with a simple mild soap and water. Any other chemical will damage the fabric and powder coated finish. Storage of the netting in a dry place when it is not needed will extend the screens outdoor life. See some of my storage solutions in my post here. For those that do have a mosquito problem after dark by the pool or on their patio, this Offset Patio Umbrella with a Mosquito screen will keep you and your guest free from bites. The screen can be installed in minutes with Velcro straps and zippers for easy assembly. 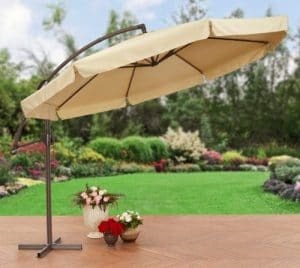 The big drawback of this umbrella is that it is not easy to move to another location easily and you do have to purchase patio stones for ballast for the base. I like the dual purpose of this umbrella, you can use for shade during the day and after the sun goes down just put up the netting for protection. A bistro set or small conversation set will fit inside of the netting so you sit back and relax with a few friends and a cold adult beverage with out being supper for some bugs. If you have any questions or something to add to this post, leave me a comment with the forms below and I will get back to your shortly. I didn’t actually know about this before I came across this article. Always bothered with a lot of mosquitoes here at summer time, which makes it uncomfortable to sit out late summer evenings. Here in Norway it is bright all night in the summer, and it is nice to sit outside. But a lot of mosquitoes make it an unpleasant experience. However, I use mosquito nets on windows on the house so they do not enter. But this was smart so has outdoor protection as well, and so convenient that it can be used for sun and rain protection during the day, and then for mosquitoes in the evening. Nothing to say that it is heavy to move, it can be left in the same place. You write that it cannot be used when there is a lot of wind, but here it is usually little mosquito when there is a lot of wind, so that problem is not to big or? This is not much of a problem, when the wind is high you can just put the umbrella down and it will handle the wind a lot better. As you state the mosquitoes will not be a bother when the wind is up. If the winds are really high you should take it down and store it. This one comes with perfect timing as my parents who are approaching their mid-fifties and who are on a spending spree are busy planning to put a pool and hot-tub in their backyard this summer, and yes, I’m thinking something like an offset umbrella will be straight up their alley to add as an accessory. Your site has plenty of awesome ideas but this one might be exactly what they’re looking for as they convert their backyard into something amazing. Thanks for reading my information and I am glad that you got something from it. If you need any more information, let me know if I can help with your decision. We built our patio last summer and actually looked at a similar product but decided to go with a stationary sunroof because I was concerned how well the umbrella would handle windy days. I guess you could put the leg in some concrete but I think it might still swing around a bit. If my patio was in a bit more covered place I would have probably gone with it. Also for the bugs we got a simple Thermacell repellent and I must say it’s been fantastic! You should do a review on their products. We get a lot of mosquitos here in Finland most summers and you have to have something to fight against them if you want to stay outside during the night and keep your sanity. I guess the net would do the same thing but we wanted a more open solution. Thanks for the interesting review! I am glad you found a way to full fill your needs of shade and bug protection. The Thermacell repellent has been on my list for a review, I have not tried their products yet. I was sitting on the front porch in my chair this evening and the mosquitoes chased me in. I will look them up and give them a try this week.